Suitably inspired to start my week of baking in style, I splashed out on Paul Hollywood‘s book, “How to Bake” – after all, I was after getting back to basics, so who better to consult than the master baker himself? 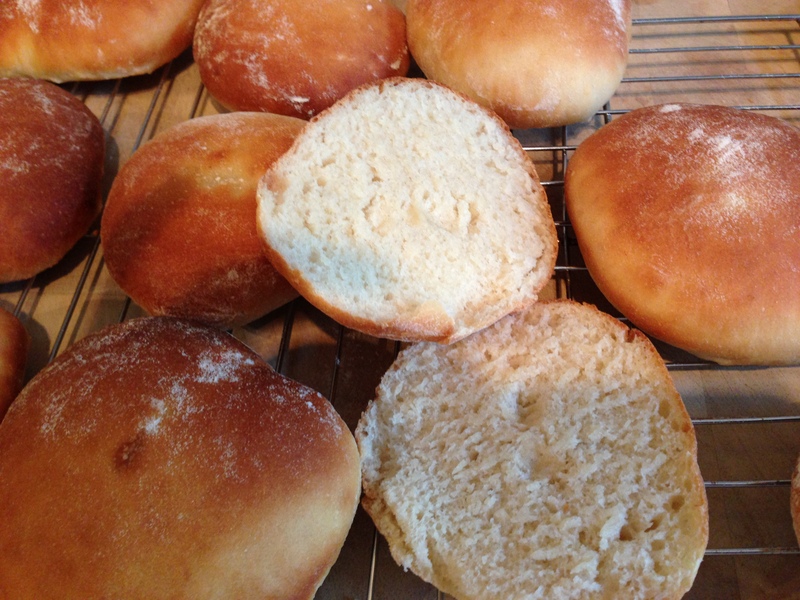 This is my first attempt at his recipe for Barm Cakes, which all in all worked quite well. My one reservation as the limited amount of time I had (these needed to be on the table for an entertaining lunch), combined with the recent drop in ambient temperature – I think that next time I’d like to give them longer to rise and longer to prove as I didn’t get the growth that I had expected. Having said, the texture was great, nice and light with a subtle sweetness. I followed the recipe to the letter but for some reason the dough didn’t rise very much like most bread other doughs the double in size . I’m beginning to think I missed out something.???? 1. Gently but meticulously stretching out and folding in to knock the air out after the first rise*. 2. Better rolling of the dough into balls. What I found worked was to roll the dough from under the centre of my palm out and around to my finger tips – placing moderate force on the dough whilst rolling under the centre of my palm. Too much flour on the dough and it doesn’t grip the work top meaning it got pushed around without balling (I used my granite worktop saver which seems not to need flouring or oiling as much as other surfaces). Some dough also just didn’t ball well. For these I folded the edges into the centre of the dough a few times and again rolled them into a ball with a much better result. 3. I also deviated from the book by flattening the rested balls of dough under my palm rather than using a rolling pin. I used a wiggling motion to try to retain as much of the air in the dough as possible. After my first attempt at these I felt I had over worked them with the rolling pin and forced too much air out of them. It seemed odd to effectively knock them back at this point so I didn’t. I thought I had set the oven too hot because the tops of the buns were hard to the touch when they came out of the oven whereas my first batch had been lovely and soft. I covered them with a tea towel and left them on the baking tray – the escaping steam softened the tops. Not sure if I made an error but they are fine now. * I made the dough exactly to the recipe, kneaded it and then refrigerated it for 5 hours in the oiled mixing bowl covered with cling film to rise. Foolishly I used a ceramic mixing bowl which stubbornly holds it’s temperature making the cooling and returning to room temperature a longer process… I took it out of the fridge and replaced the cling film with a tea towel for an hour before using. When I could smell the dough from across the room I knew it was ready. My eventual aim is to make the dough the evening before it’s required and remove it from the fridge just after breakfast so fresh barm cakes are achievable for lunch with a lot less stress. I also found that a large vacuum storage bag made the perfect proving bag for a largish baking tray.